This review first appeared in the February 19, 2004 issue of the North County Times. "F"Fought Down" is not the kind of CD to create a buzz  at least not a huge, mainstream buzz the way that, say, Steely Dan's last album did. For starters, this is Ken Layne's first real release in 16 years. Further, it's only his second professional recording overall  the first being the 1988 release from his first band, The Outriders. So Layne and his new band, The Corvids, have little name recognition, even less of a recent track record, and he's getting to the point in life where he's a bit long in the tooth to be hailed as the Next Big Thing. And yet, there is a buzz about this CD, at least among Southern California music fans with any kind of memory  and for some very good reasons. Layne's not just some guy putting out a vanity album. He was an active part of the whole SoCal roots scene in the early and mid-'80s, moving in the same circles as The Beat Farmers, Mojo Nixon, The Blasters, Cindylee Berryhill and the Paladins. As front man for The Outriders (who opened for The Beat Farmers and Mojo Nixon) and later as lead singer for the Road Hogs and a brief stint in Buddy Blue's band The Jacks, Layne seemd on the verge of breaking through nationally when he up and moved to Europe to become a news service reporter  apparently giving up on music. Then last fall, Layne self-released a collection of demos and working versions of songs under the title "The Analog Bootlegs"  and showed that if he hadn't played publicly in a decade and a half, he never stopped writing songs, never ceased thinking about music. Now we have "Fought Down," a more polished exploration of the ideas and many of the songs from "The Analog Bootlegs." If, as already pointed out, this isn't the Next Big Thing, it is a very good set of the kind of pure rock 'n' roll hardly anyone plays anymore. It also shows that Layne and his co-writers have a near-perfect touch at turning out a 3-minute radio-friendly song (even if radio isn't so friendly to well-written songs these days). More importantly, it shows Layne inhabiting that fertile space between country, blues and rock where thoguhtful lyrics and lush melodies can co-exist without commercial pressure to sell out. The album starts with a slow country-rock-blues, "Ain't They Pretty"  think of Little Feat or The Band, and you've got the same kind of groove. The title track is next, and sounds like a lost Rolling Stones track circa 1973, with the kind of jagged edginess that marks a band composed of real musicians more worried about the larger result than getting every note perfect. "The Sun Don't Shine," "Glitter On" and "Here's to You" are purer bits of country than just about anything coming out of Nashville these days, and remind more than a bit of singer-songwriters Guy Clark and Tom Russell (or the late Townes Van Zandt). "I Should Be That Guy," "Worried," "Like a Train," "Lincoln Town Car" and "Mama, Take Another Stand" were all on "Analog Bootlegs"  and all are dramatically improved with the fuller band, tighter arrangements and studio production found here. Of course, Layne isn't the entire story (although he is both catalyst and center of gravity). Matt Welch adds a lot of the country flavor on acoustic guitar, while Axel Steurwald's electric guitar work is what brings much of the edginess. Drummer Steve Coulter and bassist Jeff Solomon create the kind of hybrid backbeat that allows the rest of the band to foray into country, blues, rock and roll ... anywhere they want to go, really. There's nothing trendy or corporate here  if it's the latest sounds you crave, you'll need to keep looking. 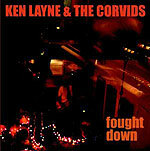 But if you hunger for real rock 'n' roll  the kind of music that practically smells of stale beer and leather jackets and overfilled ashtrays, the sort of songs that sound best while rolling down the highway with the windows down, then Ken Layne & The Corvids more than fit the bill.